Santa Rosa County, Florida is serious about helping you grow your business. And we are ready to help you every step of the way—from site selection, incentives, workforce recruitment and training, to your grand opening—the Santa Rosa County Economic Development Office is here to expedite and guide you through the process. Coupled with Florida’s stable and highly favorable tax climate, Santa Rosa County provides advantages that make growing with us easy and profitable. We are located only 70 miles from the new Airbus manufacturing facility in Mobile, eight and a half hours from Boeing in Charleston, and only five hours from three additional aviation OEM’s. The Whiting Aviation Park is a planned 269-acre commercial/industrial park adjacent to Naval Air Station Whiting Field in Northwest Florida. 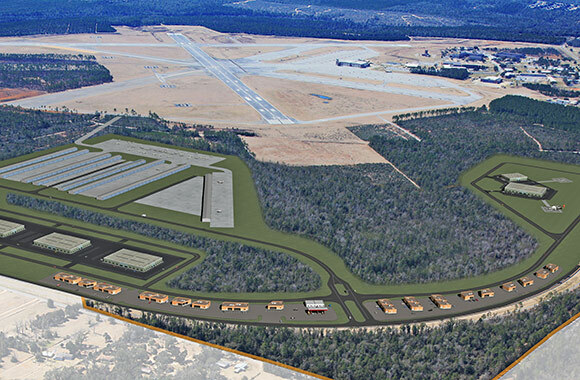 Through a Limited-Access Use Agreement between Santa Rosa County and the United States Navy, future civilian tenants of the Aviation Park will be able to use the Navy’s airfield facilities. Once developed, the park is expected to attract a mixture of aviation related commercial and industrial development as well as non-aviation development. Manufacturing, maintenance, repair, and overhaul type aviation operations will be the primary target activity. NAS Whiting Field currently trains all helicopter pilots for the Navy, Marine Corps and Coast Guard. The base also provides 60 percent of primary pilot fixed wing training for the Navy and Marine Corps. Nearly 1,500 U.S. and foreign military students train aboard the NASWF complex each year. It is the busiest naval air complex in the world with north and south fields launching more than 400 flights a day and supporting 1.3 million take-offs and landings, or 13 percent of all Navy and Marine Corps flight hours world-wide. During normal flight operations, an aircraft takes off or lands every eight seconds. The Limited Use Agreement between the Navy and the county is the only one of its kind. Northwest Florida has the largest concentration of military retirees in the nation, providing a trained, ready workforce. Six-county area has the highest concentration of military retirees in the U.S.
Over 36% of our population has an associate degree or higher. Local schools ranked #2 in the state. Local incentives up to $800 per position, per year. Ten Colleges, universities & technical centers in the three county area. Four military installations located 45 minutes or less from our certified sites.